New Year's Resolution: get more done...with chocolate? “Feed your brain more chocolate. Break into a bar of chocolate, then take over the world. A nip of it boosts your short-term productivity by 12%, according to a study in the Journal of Labor Economics. 'Chocolate makes people happier, and happy people may be less distracted by worry, so they get more done,' theorizes lead researcher Andrew Oswald, Ph.D, professor of economics and behavioral science at the university of Warwick in England." Of course, chocolate probably isn't the only thing that makes you happier and more productive. 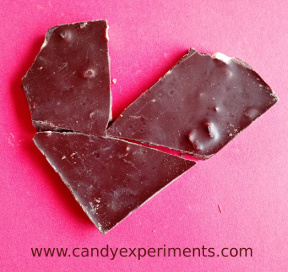 But I'm always inclined to believe the science that shows off the benefits of chocolate! With two weeks to go before Christmas, you've got just enough time to make your own sugar crystal ornaments. Here's how! Make a few ornament shapes out of fuzzy pipe cleaners. Make sugar crystal solution by adding 4 cups sugar to 2 cups water, and boiling until the solution is clear. Pour the solution into a quart jar or small glass jars. Lay a pencil over the jar(s). Use string or twist ties to hang the ornaments from the pencil. The ornaments should not be touching each other, or the sides of the jar. Wait two weeks, or until crystals form. Remove the ornaments, dip in water to rinse, hang dry, and admire! For more instructions and explanations, see my article, "Grow Sugar-crystal Ornaments," in the December 2016 issue of Highlights. 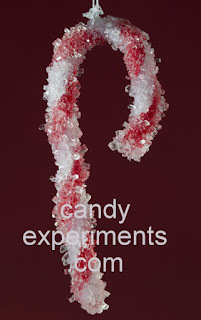 Candy experiments with cousins led to a new discovery: although candy canes don't float, some emit bubbles that do. 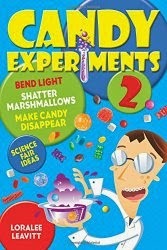 See the red candy cane shapes with bubble outlines? The candy canes are still at the bottom of the dish, but the bubbles have floated to the surface, still in candy cane outline.